If you’re in need of urgent help, please call us on 1300 007 674 and we will endeavour to get to you as soon as we can. It is recommended to choose a professional arborist for prompt emergency tree services as there are many factors to take into consideration before you remove a tree. 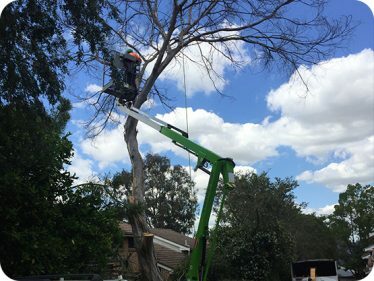 Elevated Arbor Care provides 24-hour emergency tree services in a safe and skilled manner with minimal disruption to the surrounding property and landscape. 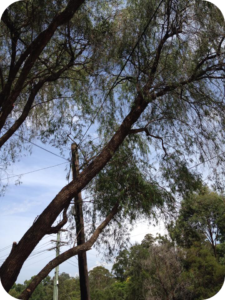 Our experienced arborists will take care of any fallen trees, trimming of broken branches and clean up of other natural debris after a storm with unrivalled professionalism and efficiency. We have the experience and equipment to remove trees under the most difficult and demanding surroundings. Safety is the main concern during tree work. Our team of experienced staff are also qualified to use cranes to remove trees when required. Using a crane has many benefits including minimising the impact of tree removal to your garden and removing trees located in difficult or dangerous areas. Our emergency tree service covers all suburbs of Sydney including the Lower/Upper North Shore, Hills District, Inner West and Western Sydney. View the emergency tree work we have completed in your area. Storms in Sydney are becoming more frequent and severe! Has the recent thunderstorm wreaked havoc, toppled and damaged trees in your yard and left you wondering about which is the best tree cleanup services near you in Sydney? Our certified arborists at Elevated Arbor Care are on call 24-hour a day for same day service! Whether you are dealing with a fallen tree in your backyard or a dozen fallen trees that need to be cleared across your property, we provide upfront pricing and transparent storm tree removal cost. The fallen trees or branches in the aftermath of a storm are often a mess and could even put your family’s safety at risk. Therefore, even before a storm, it is recommended to call certified arborists for tree removal service and remove any immediate risks such as branches or trunks falling on your property. Our expert arborists inspect and assess your property to identity all hazardous conditions design the approach for necessary cleanup safely and restore the beauty of your landscape. Call Elevated Arbor Care for 24-hour emergency storm-damaged tree cleanup services today to promptly get rid of the debris from storm-damaged trees.